Introducing … The Milwaukee Running Festival! Today is a great day for the MKE running community. For all of you that have been saying our city needs a major marathon … that day is here! Today, Chris Ponteri, Executive Director of Milwaukee Marathon, Inc., announced the inaugural Milwaukee Running Festival. The 2015 event will take place Oct. 30-Nov. 1 and will include a marathon, half marathon, 5K and one-mile race. All races will be staged entirely within the city of Milwaukee and the marathon will be the first to be routed entirely through the city of Milwaukee’s neighborhoods and landmarks. Milwaukee’s Summerfest grounds will serve as the start and finish area for the marathon and half marathon. Along the way, runners will travel through Milwaukee neighborhoods, including Downer Avenue, Brady Street, Brewers’ Hill/Commerce Street, East Town, West Town, Sherman Park, Walker’s Point, the Third Ward and others. The proposed route also passes a host of landmarks, including Miller Park, the Harley-Davidson Museum, the University of Wisconsin-Milwaukee, Marquette University and The Milwaukee Art Museum. 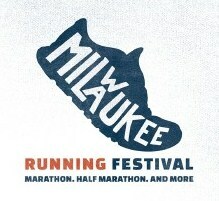 The 5K and one-mile races will be staged in downtown Milwaukee. Milwaukee Running Festival is also putting a major emphasis on charitable partnerships, with a goal of contributing $250,000 to partner charities during its inaugural year. Charities that are approved as partners will receive assistance with fundraising and recruitment efforts. So there you have it – the latest on the newest MKE race! This entry was posted in Race Previews and tagged Chris Ponteri, Milwaukee Races, Milwaukee Running Festival, Race Previews, Running in MKE, Upcoming Events. Bookmark the permalink. Sounds awesome! Being from WI, I would love to come back and run this race. MKE would love to have you visit and race! I know the marathon is a huge deal, but I’m also excited for another one-mile race… especially a late-season offering! We agree – it’s fantastic to see several race distances on the lineup for the weekend. A one-mile race is a great addition!